The boys from Pine Ridge get quite an education when the town finds itself in need of a new school teacher. The candidate they hire is eminently qualified - and not at all what president of the school board, Lum Edwards, had in mind! Professor Sloane, tireless in the pursuit of knowledge, spearheads ambitious plans for an observatory, a rocket ship, and a trip to Mars - manned by none other than Lum and Abner! With financial backing from the unscrupulous Squire Skimp, the duo declares themselves "scientifics" and set their sights on the stars. 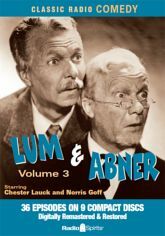 Chester Lauck and Norris Goff star in 37 consecutive digitally restored and remastered episodes.